Renz Wins J/70s, J/24s Got Boned! 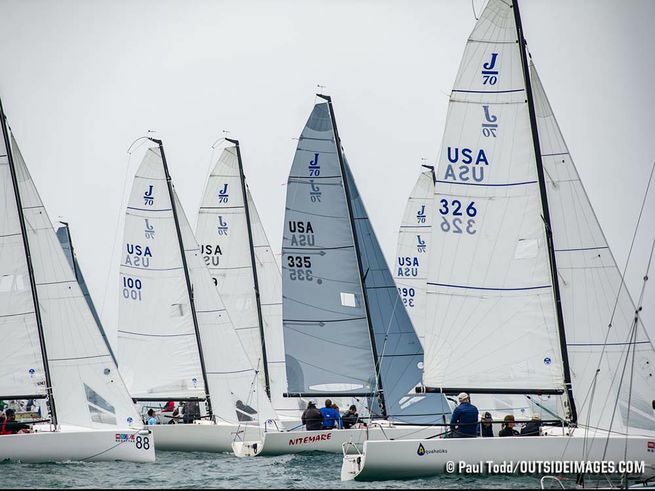 (Chicago, IL)- From August 24th to 26th, the Chicago YC hosted the Verve Cup Inshore Regatta on the beautiful blue waters of Lake Michigan, right off the majestic waterfront of Chicago. The J/70s enjoyed a total of nine races over the three days and the J/24 one-design class a total of just five races. Sarah & Mark Renz’s BERTEAU GROUP won the ten-boat J/70 class with all finishes in the top three, including three 1sts, three 2nds, and two 3rds for 17 pts total. Starting off slowly with a 4-4-6, Martin Johnsson’s AQUAHOLIKS virtually smoked the fleet for four 1sts and two 2nds for 22 pts total to take the silver… just imagine if they had started off the regatta with that streak? Third was Bob Willis’ RIP RULLAH a long distance back with 43 pts. The J/24s saw Josh Bone’s MOTORHOME actually motor home to the top of the leaderboard with a blistering 2-2-1-1-3 tally for 9 pts total. Not panicking was Richard Graef’s DON’T PANIC, collecting a 1-4-5-5-1 for 16 pts to take the silver. Then, Cory Huseby’s BORK BORK BORK! took the bronze with an 8-1-2-3-5 for 19 pts total. For more Verve Cup Inshore Regatta sailing information Add to Flipboard Magazine.